It’s almost time to return to Champions League football and, now the winter break is out the way, the knock-out phases can commence! 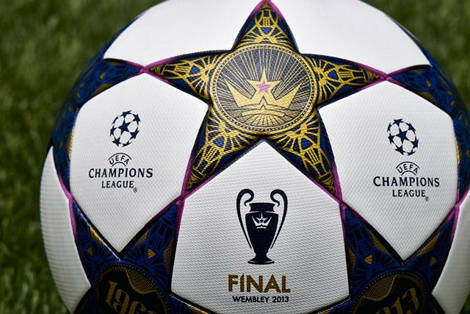 The Champions League finale once again finds itself at Wembley, and adidas are on the ball again with launch of the adidas Finale Wembley 2013 – the official match ball of the 2013 Champions League final. 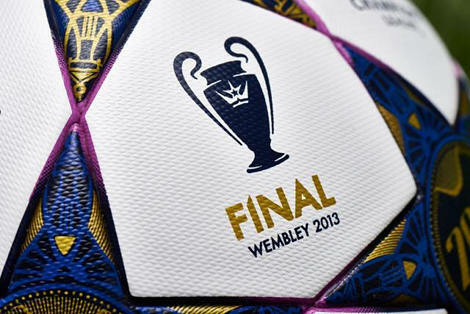 2013’s final will be the seventh time that the biggest game in club football has visited the ‘home of football’, and adidas have designed the adidas Finale Wembley 2013 to pay homage to these historic matches played over the last 50 years. 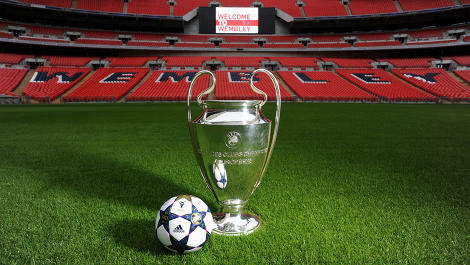 Wembley has seen some of the greatest teams in history grace it’s pitch, from the AC Milan team in ’63, Manchester United in ’78-79, Ajax in ’71 to Liverpool’s ’78 side and Barcelona’s all- conquering teams in ’92 and again in 2011. The aesthetic of the adidas Finale Wembley 2013 reflects these events – specifically the European cup finals that have taken place over the last 50 years, incorporating the years in which the finals took place into the well-known star panel design – an iconic feature of adidas’ official match balls for the competition. Each panel contains the year of a Wembley European final, whilst the crown on the ‘centre’ panel represents the quest to become the ‘Kings’ of Europe. 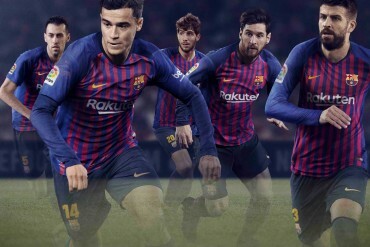 The technical graphics and the expressive colour scheme come together to reflect the grandeur of the occasion where this year’s winners will be crowned in front of the near 90,000-strong crowd. 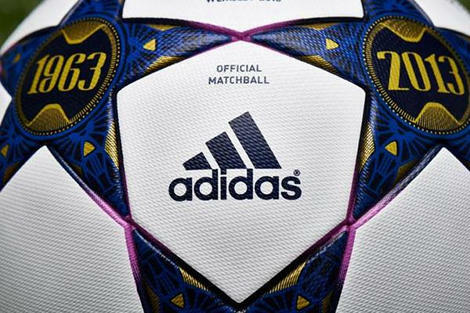 The technical features remain the same as they have done for adidas previous Champions League matchballs. 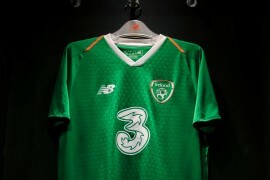 The star-panel designs are a technical triumph for the three stripes, perfectly imitating the ‘starball’ graphic of the competition, whilst keeping the ball incredibly spherical and structurally solid. 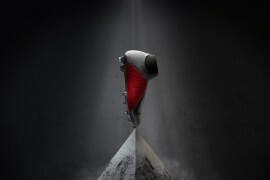 A special TPU casing is textured, allowing not only more stable flight, but to improve friction between boot and ball for more precise passes and shots in all weather conditions. adidas has a rich history in developing match balls having been the official supplier for all major UEFA and FIFA tournaments since 1970. 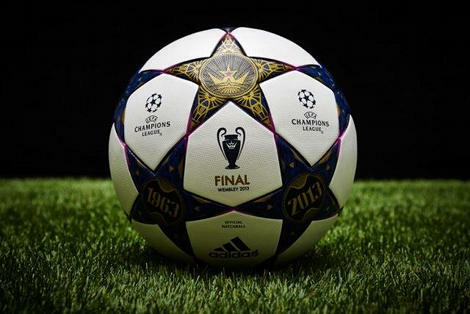 This year’s ball will be the twentieth Official Match Ball adidas has produced for the UEFA Champions League competition. Available in shops this Friday, the adidas Finale Wembley 2013 will see it’s first use in the round of matches beginning February 12th, and be used all the way through to the final. Confusing wording on our part, Fred – referring to the Man U team that played in (but lost) the Cup final to Arsenal at Wembley in ’78-79 as being one of the great teams to have graced the hallowed turf – though that list of teams did come from adidas, we must confess! Amended now, thanks for the heads up!